At this stage, I cut out a plastic/card paper circle smaller than the circle I end up with after round 7 and insert it inside my doll at the later stage before stuffing, to keep the base of my snowman flat. 18. (optional, you may wish to fasten off after round 17. )repeat round 17. 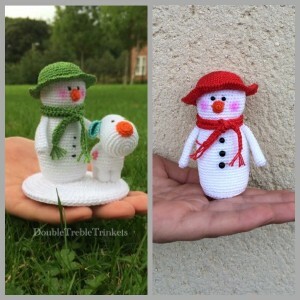 This entry was posted in Christmas and tagged crochet, crocheted snowman, the snowdog, the snowman. Bookmark the permalink. Hi! Thank you so much for your website! I’ve almost completed a snowman and I am AMAZED at how you do this detailed work all the time! It’s taken me so long. I’ve really enjoyed making this little guy. I just need to add his buttons and make a base. I can’t quite decide if I have the patience to make the doggy friend. My eyes might also need a break! But how do you make the little dog? And the reindeer? They are SO STINKIN CUTE I am dying for the patterns on these two! !